Note: Some links contained in this article are affiliate links and I have clearly indicated which are affiliate links in the article itself. Let’s be real. The idea of prepping meals ahead of time before baby comes is much easier said than done. I don’t know about you but when I’m in those final weeks of pregnancy the last thing my body wants me to do is to stand in the kitchen for hours cooking. Cue pain in feet, legs, hips, back…no good. However, once your sweet baby is earth-side you’re going to wish you had at least planned a bit since there isn’t a ton of time to cook between feedings, diaper changes, snuggles and your own personal recovery. 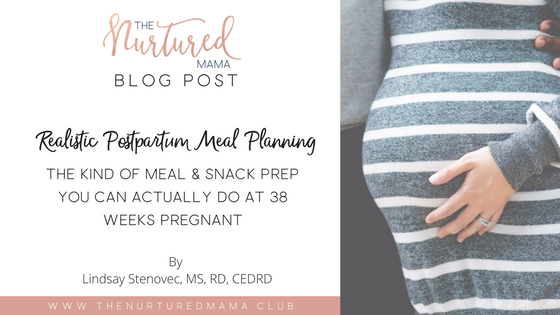 I’m currently 38 weeks pregnant with my 2nd child so I figure this is perfect timing to develop a REALISTIC postpartum meal prep plan that will not only benefit my family but hopefully yours too. Although my husband and I have planned ahead to figure out how to have him home for a bit longer this time (3 weeks vs. 6 days) I know that I will inevitably find myself alone with a baby (and likely a toddler) and need food that is ready to eat and extremely easy to prep (bonus if it can be consumed with one hand). However, I also know that I’m just not that mom (or dietitian) who has the energy or motivation to prep 21 postpartum meals at the end of my pregnancy. So I had to prioritize. I chose to focus on a couple of breakfast items, a killer snack option and then purchase several ready-made frozen foods to have on hand. The patties are in the freezer. These energy bites are so yummy and easy to make! Recovering from delivery and nursing can make you super hungry so these little suckers do just the trick when I’m in need of a nourishing snack that will leave me full and satisfied! I LOVE my Instant Pot (affiliate link). It’s been a lifesaver during dinner prep with my toddler so I know it will be the gift that keeps on giving when I have a toddler AND an infant making their demands while I try to get food on the table. Here are the recipes that we’ll have set up on Plan to Eat. More on Plan to Eat towards the end of this article. Oh my gah this pasta dish is SOOO easy and I’m telling you it is RESTAURANT QUALITY. You can also modify it in a thousand ways – you could do a non-creamy version or throw some zucchini and eggplant in there. The options are endless. If it ever rains in San Diego this season, we’ll be whippin’ this sucker up for sure! This one takes a tad more time than the others but it’s worth it! We either top this with chopped bell pepper, cabbage, avocado and sour cream and include a side of chips OR use the filling to make burritos. This is great as a make-ahead and freeze meal, too! Just Mango Dried Mango from Trader Joe’s (In addition to fruit leather and dried fruit bars I’m actually planning to include these as a snack early on in labor). Generate shopping lists with the single click of a button! Do you know what that means for postpartum meal planning? Once I make the menus, it’s done! I can generate and send that list off to my husband or another family member. I can even ask someone to use it to load into a grocery delivery system. Use my referral link for a free 30-day trial. You can also request to be my “friend” and get access to all of my recipes and saved menus! 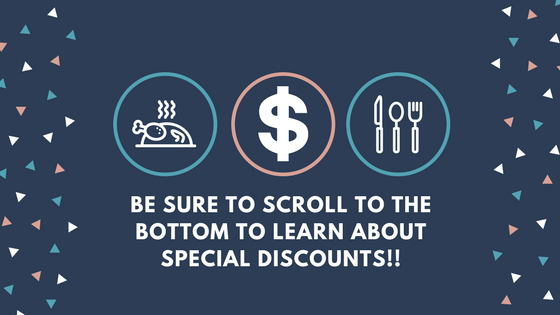 $5 off my Plan to Eat Training Course (Also known as my Family Meal Planning Survival Guide). That will bring the cost down to just $9.99). In this course, I provide training on how to use the software and also tips and tricks from years of meal planning in the professional setting so that planning family meals and pulling up that grocery list takes only minutes each week!